Stoke City midfielder Ibrahim Afellay has suffered a knee ligament injury and could be out for eight months. Manager Mark Hughes said the 30-year-old Netherlands international twisted a knee in training on Friday. "It's unfortunate. He'll come back stronger with our support," Hughes told Sky Sports before Saturday's Premier League match at Manchester City. 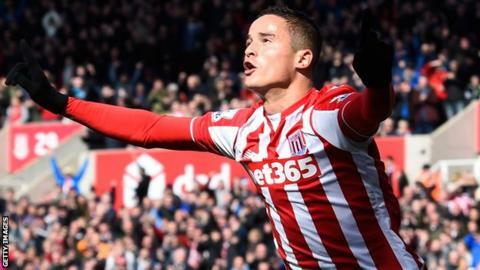 Afellay, who joined on a free transfer in July 2015, has played 31 of Stoke's 35 league games this season. BBC Radio Stoke reported that the former Barcelona and Olympiakos player is not expected back until Christmas. His absence adds to Hughes' injury problems, with goalkeeper Jack Butland out for the rest of the season with a broken ankle. Xherdan Shaqiri is sidelined by a hamstring problem, while Jon Walters, Glen Johnson and Marc Wilson have knee issues.